These writings add color to the history of veganism. Leslie Cross (1914-1979) was a resident of England who became vegan in 1942, two years before the term was coined. In July 1943 The Vegetarian Messenger, then magazine of the Vegetarian Society, printed a letter from Cross condemning the consumption of cows' milk . This sparked a correspondence that ensued for many months and culminated in Donald Watson asking vegetarians interested in avoiding dairy to write him. Over 50 responses were received and in August 1944 he and Elsie Shrigley petitioned the Vegetarian Society to allow an official non-dairy faction. Their request was refused, and Watson went on to form the Vegan Society in November 1944. Due in considerable part to Cross, by 1951 this group was explicitly rejecting all nonhuman exploitation, not just flesh and secretions. Watson considered Cross a "great friend" and said he "must be put in the records" as an "outstanding" and "faithful" contributor to the cause of veganism . To address a practical hurdle on some people's path to veganism, Cross founded the Plantmilk Society in 1956. 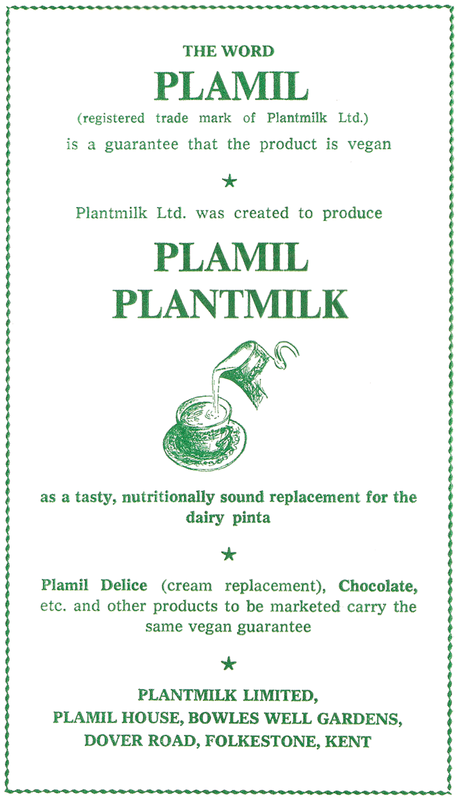 After five years this effort gave rise to Plamil, a company that in 1965 began selling a canned soy milk concentrate in London shops. "Man and Nature" is derived from a talk he gave in 1948. It was printed as a pamphlet for several years by the Vegan Society . He argued that we injure ourselves by exploiting nonhuman animals. "In Search of Veganism—1" and "In Search of Veganism—2" appeared in consecutive 1949 issues of The Vegan. He claimed that an official definition of ‘vegan’ was necessary, and he offered thoughts on what it should entail. "The New Constitution" and "Veganism Defined" date from the spring of 1951, when Cross was vice president of the Vegan Society . He commented on the group's newly "revised and extended rules", including a definition of ‘vegan’ consistent with his suggestions two years earlier. “David, aged four, has been vegan from 16 months old and has maintained normal weight and physical development. He took fruit and vegetable juices and even raw salads from a very early age, with nut-cream until a year ago when Soylac was introduced. Now the latter is used for cereals and cooking only, drinks being of juices almost entirely. At 3½ years old he contracted measles, but the attack was slight and the recovery quick. Francesca is now two years old and has been a vegan from birth (her mother being also vegan for a year before that). She was weaned on to nut-milk at 9-10 months and then on to Soylac at 14 months. Now she chooses fruit and vegetable juices to drink, and raw salads in preference to cooked vegetables. 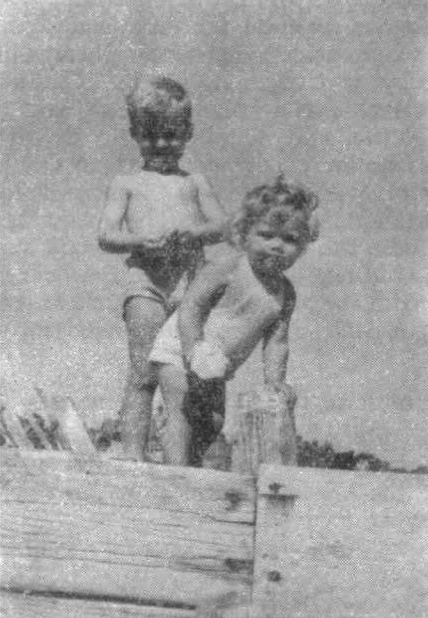 She is very fit and sturdy, remarkably healthy and full of life, and it is interesting to note that she did not develop measles although she and David were playing together. “There can be few vegans, particularly vegan parents, who would not welcome the appearance of a nourishing and workable vegetable milk, ready-made and suitable for a wide variety of uses. Yet no such product is at present marketed in this country. The use of a vegetable milk is not to be disparaged on the grounds that it is an aping of the animal milk habit. Like the compound solid vegan protein savoury, a compound liquid vegan protein food would be a valuable adjunct in broadening the scope and range of vegan catering. And it would undoubtedly have its place in providing quickly and conveniently for the needs of the growing vegan family. Such a product would also prove helpful and attractive to vegetarians and others wishing to make the change over to a vegan diet with the minimum of difficulty. Those with electric mixers can certainly make highly nutritious milks from nut creams, raw nuts, or soya flour, etc. But there is still room for a compound product of standardized vitamin, mineral and amino acid content. It is not that it is essential: but it would certainly be highly convenient. Is the time and are circumstances ripe for the marketing of such a product? Mr. Leslie J. Cross intends to find out. He has proposed an entirely independent body, the Veganmilk Association, in no way connected with any existing organisation, to determine the response of vegans, vegetarians, food reformers and those of orthodox dietary habits to the idea of getting a good non-animal milk on to the market. His announcement appears in this magazine. What is your response? Provided sufficient support is forthcoming, an effort will be made as early in 1956 as possible to form an organisation with the above suggested title, for the following purpose: To produce and make available to the general public in Great Britain a milk, the ingredients of which would be of plant origin; which would satisfy nutritional requirements; and which would be palatable, attractive, and simple to use for the purposes for which dairy milk is now used. The Association would probably function in three main stages: (1) It would conduct an enquiry into progress made in this and other countries in the manufacture of non-animal milks. (2) Based upon information thus collected and collated, it would consider the problems connected with the successful manufacture and sale of such a milk upon the general market in this country, including the question of scientific research and experiment. (3) Upon the successful manufacture on a small scale of an acceptable milk, the Association would consider the question of large-scale manufacture and sale, including the organisation required to promote such manufacture and sale; such, for example, as the formation of a Limited Company. While the work of the Association would be largely motivated by the ideals of vegetarianism and veganism, it would nevertheless function as a body with a precise practical job to do, and membership would be open to anyone prepared to support its work. The work would take a number of years and require considerable financial support. It would call for sustained and high endeavour, and though difficult, would be by no means impossible to achieve. Its successful outcome would be of immense value in many ways. Any person interested in the proposal should send their name and address to Leslie J. Cross, 39, Willow Crescent East, Uxbridge, Middx., who will, if support is sufficient, act as convener of an inaugural meeting. “It was with the most mellow nostalgia that I read Donald Watson's words in your current magazine. It was I who initiated the correspondence in the then Vegetarian Messenger which ultimately led to Mr. Watson founding the Vegan Society, and, of course, I was very happy to be among those few first founder members. For some time I was also an officer of the small but active London Vegan Group — it is incredible to think that twenty-one years have elapsed! You may rest assured that I shall be with you in spirit and send you every good wish for the next many twenty-one years! I can, of course, assure you of the very best wishes and congratulations to the Vegan Society from the Plantmilk Society, since it was entirely because of my vegan convictions that I founded the Plantmilk Society in 1956. Although the Plantmilk Society embraces members who are neither vegan nor vegetarian, the impetus came from vegan ideals. Please convey not only the best wishes of the Plantmilk Society, but my personal regards to those members of the "Old guard" who may still remember me. 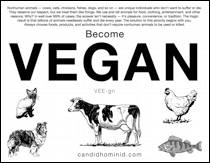 “Jack Sanderson, in the Chair, then introduced Leslie Cross, the founder of the Plant Milk Society, as one of the key people who had started the Vegan Society twenty nine years ago. Leslie Cross referring to the early days of the Society said that one of the factors that hindered the growth of the Vegan Society had been the absence of an alternative to dairy milk and of a non-animal source of B12. Early vegans, unable to take cows' milk because they recognized it as the end result of suffering and violent death, made do without milk or substituted home-made blends of nuts and soya and water. These lacked B12 and some early vegans became ill and many would be vegans were frightened off. Leslie Cross felt moved to work for the production of a humane milk alternative. 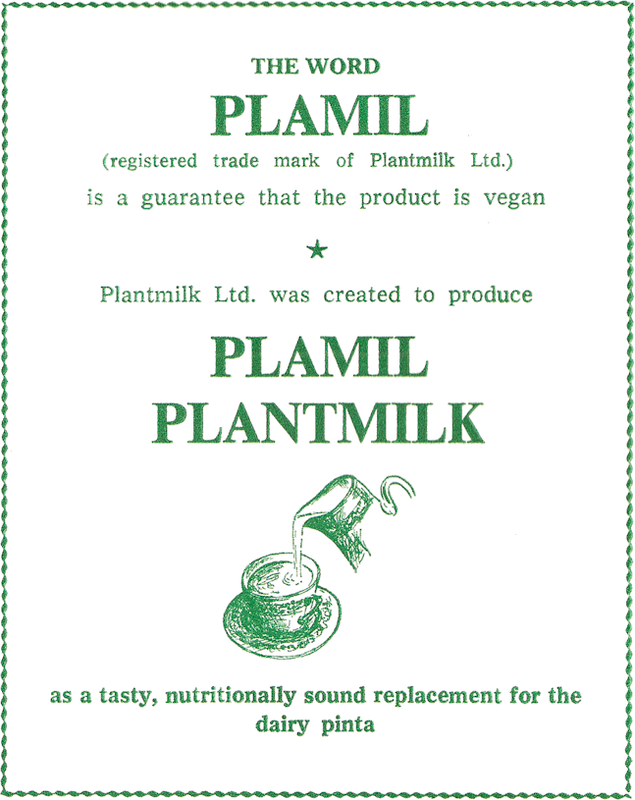 Many vicissitudes were lived through before his objective was achieved and Plantmilk, under the legally acceptable name ‘Plamil’, was marketed in 1965. It was being used by babies, children and adults who were allergic to animal milk, by diet reformers and the logically minded who regarded it as a better food for human consumption and by those who found distasteful the killing and the hurtful exploitation inseparable from dairy farming. It was not sold widely enough to pay for the cost of production so the Plantmilk Society had to promote other products. In closing, Leslie Cross emphasised the importance for man's evolution of freeing himself from "the restricting confines of a slave owning economy and a slave owning mentality". “Leslie Cross, vegan for 35 years, founder member of the Vegan Society, and of the Plantmilk Society, died peacefully in his sleep on 2nd December, 1979. Inspired by his deep love of all life he looked forward to the day when plant milks would be generally used and a great burden thus lifted from the gentle cow. He was managing director of Plantmilk Ltd when it was at Langley, Bucks, was Secretary of the Plantmilk Society until his death, and often used his skill as a journalist to write on behalf of animals. We offer our sympathy to his wife, Constance, who worked so hard with him to forward the cause of animal compassion, and to his son and daughter, who were fine examples of vegan children. “A year or two before the Society was formed, I was corresponding with a very small number of people, scattered far and wide. Leslie Cross, who founded the Plantmilk Society, was a great friend of mine. He died comparatively early, well, in his early 70s, I think, and, in a letter he sent me, shortly before he died, he mentioned that, as a child, he'd fallen heavily from a gate and the authorities thought he might not recover and, I think, if he had an early death for a vegan, it may have been the consequence of that. He was certainly one of the outstanding people who have served the movement and, in retirement, he went up and down the country, giving his lecture, "Milk of Human Kindness" — all voluntarily of course, paying his own expenses, and coordinating Frey Ellis and others, medical people who were interested in the idea of creating a plant milk that was acceptable — some of the earlier efforts were pretty crude! But it was not until 1965 that my great friend, Arthur Ling, who has devoted most of his adult life to creating and propagating the vegan idea, especially with regard to dairy produce, felt able to market an acceptable alternative to cows' milk. And of course, he's gone on from there, and, apart from running the Plamil firm, he's taking a great interest in the feeding of vegan infants. Because, of course, if any diet fails to produce healthy children, well, we must find a reason for it, and proceed from there, not taking "no" for an answer. But now, thanks to Arthur's work and those of many others, we've reached a point where the only safe way to rear children is on a vegan diet, which obviously must conform to a few well-proved requirements, and that's why Plamil and certain other vegan proprietary products now are fortified with vitamin B12, which, although it's a vitamin that we need an infinitesimally small amount of, we must have, and some people have lost the capacity to produce it in their own gut, so now we feel that, since B12 is a vegan product, produced quite cheaply fortunately, unlike some of our modern wonder drugs, so-called, we take it as part and parcel of our normal food intake. I would bracket, of all the many people who have subscribed to the vegan cause, I hesitate to single out anyone, but I would say Leslie Cross and Arthur Ling must be put in the records as being the two outstanding, faithful, contributors to our cause. As found in the Vegan Society's 1972 pamphlet "An Introduction to Practical Veganism". Advancing from committee member, a role he had filled since 1947 [7a], Cross was elected vice-president of the Vegan Society at its Annual General Meeting on November 11th, 1950 [7b]. But he became "very sick" and was forced to step down in September 1951 so he could heal himself with "complete rest" [7c]. Heron added an editorial note: "The above announcement has appeared elsewhere, and a number of people have already offered support should the Association be formed. Among them are some who are well known in the vegetarian movement. Interest has also been expressed by a firm that supplied the raw materials for a non-animal milk distributed in this country for demonstrations carried out by the United Nations International Children's Emergency Fund. It should be noted that membership would be open to anyone prepared to support the work of the Association, whether they are vegetarians or not. All who respond to the suggestion will in due course be informed as to any further steps it may be decided to take." Interesting stuff, thanks for doing the work and for sharing. In the following issue, Leslie Cross and Ivor Sercombe wrote the article "Veganism Defended". This blog by Nathan Schneider is subject to a Creative Commons License. Created by Nathan Schneider. Powered by Blogger.